Did you know that many of our Interns end up getting placed in our Graduate Leadership Program? 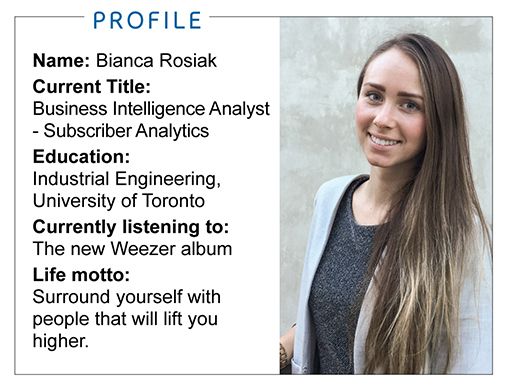 Meet Bianca, a former Intern who has joined us full-time at Bell. Bell: Tell us a bit about yourself. Bianca Rosiak: I am a recent graduate from the University of Toronto where I studied Industrial Engineering. I love travelling, film-making, and spending time with my family. I enjoy taking on new challenges and being a part of a team that is passionate about their work. I also speak Polish and I love learning more about my heritage. Bell: Can you tell us about what you do and your role at Bell? BR: Currently, I am a part of Bell’s Customer Operations Business Intelligence Graduate Leadership Program and a member of the Subscriber Analytics team. My team helps Bell to better understand our customers’ needs by collecting and analyzing behavioural data and providing our insights. Bell: What gets you out of bed in the morning? BR: I love learning new things! I was fairly shy in high school, but over the years I’ve worked to overcome that lack of confidence by stepping out of my comfort zone and getting involved in projects that challenge me. Bell: What does an “average” day look like for you? BR: Part of what makes the Graduate Leadership Program so unique is the opportunity to rotate through a variety of areas of the business. We spend our first 2 weeks in retail stores, observing and collecting data on interactions between Sales Associates and customers. This experience will give me more insight into the customer experience when I start my Business Intelligence role. Bell: What made you decide to apply for the Bell Customer Operations Business Intelligence Internship? BR: I decided to apply for the internship after hearing good things about the Business Intelligence Graduate Leadership Program and the company culture. I was intrigued by the strong community of program graduates and the level of support they receive from top leaders at Bell. I knew that by getting the internship I would learn a lot about the company and the full-time roles available, and hoped that it could be a stepping-stone into landing a full-time position after graduation. I was also excited about the potential of the program connecting me with a new network of colleagues who are intelligent, passionate, and inspiring. Bell: Do you have any advice for students who are currently looking at internship opportunities? BR: Before interviewing, it’s important to do research on company you are applying to. It also helps to prepare by creating a list of questions you want to ask the interviewer about the company, current opportunities, etc. Apply for all the opportunities that you believe can help you learn and grow. I know people that didn’t apply for an opportunity because they believed they were underqualified. I say, always go for it. You never know which employer might give you the chance. Also, get involved in different extra-curricular activities – it helps you stand out from the crowd when applying for a job. Interested in internship opportunities at Bell? Learn more on our career site.